Despite growing awareness that improper contact lens care and wear procedures can significantly increase the risk of eye infections, many consumers still do not follow the manufacturer or practitioner’s recommendations for safe practices. Interestingly, ‘comfort and handling’ was cited as a complication more often than infection – and although 90 per cent of study participants were aware of the importance of using fresh solution, many failed to discard used solution first. In another study, 20 per cent of patients polled in the UK admitted that they used tap water, saliva, baby oil, beer, Coke, petroleum jelly, lemonade, fruit juice and butter (!) as alternatives to contact lens solutions (Bausch + Lomb news release, Nov. 2011). In recent years, a plethora of industry-sponsored research papers have discussed contact lens care compliance relating to solutions, wearing modality and ocular lubricants. [ii] However, in developing safer, more effective and easier-to-use disinfection systems and more comfortable, oxygen-permeable lenses, manufacturers could inadvertently be sending a false message that it is ‘safe’ to stretch lens wear longer than indicated or to sleep in lenses more often than recommended. So, why the discrepancy between practitioner perception and patient performance? Are patients lying to their practitioners about lens hygiene and solution handling? It remains incumbent on practitioners to keep providing appropriate patient education, instruction and training in order to increase patient vigilance about the risks associated with contact lens wear. Equally important are regular follow-up visits to determine whether they are compliant with the recommended wearing and replacement schedule and to ascertain whether patients are conforming to the accepted lens, solution and lens case care guidelines. Standardizing a set of questions to elicit non-compliant behaviors and repeating professional advice at each follow-up visit can help practitioners augment compliance and reinforce the importance of good lens and solution handling practices. Be aware that the questions, depending on how they are formulated, may also generate false responses from patients, especially from those who don’t want to admit to improper lens wear and care. As an example, ask patients what happens in the morning after they have slept in their lenses instead of asking whether they sleep overnight in their lenses. 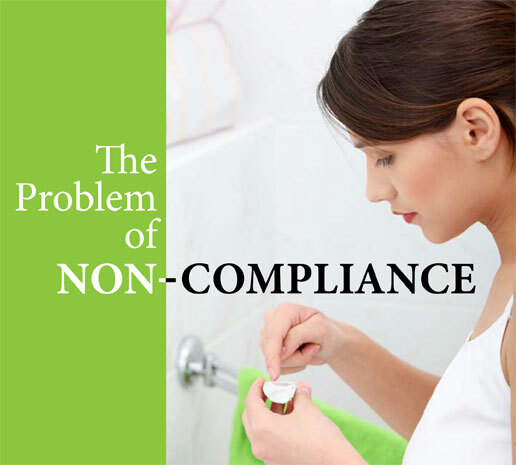 Not all contact lens-related problems are the result of poor compliance and there is no quick fix for patient non-compliance. The problem is not going to disappear anytime soon but by recognizing the different kinds of non-compliant behaviors, providing appropriate education and training, asking the right questions at follow-up visits, and delivering the consistent message of continued commitment to good lens, solution and lens case hygiene, practitioners can help carve a safe and healthy path to clean, clear and comfortable vision for all contact lens patients.